Ethan is a stay at home dad and the blog discusses what he is learning on the journey. Or, perhaps more accurately, what wrestling skills are required to wrangle twin boys who have just reached the stage in life that, in males, seems to last from the age of 2 to about 45 or so. He is hoping that the blog will enable him to share his story and hear the stories of others interested in opening up a dialogue about fatherhood and community. 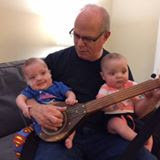 I believe his blog can serve as a resource for new fathers- especially fellow fathers of twins or fathers who started their journey in the NICU. At the very least, you can expect some great stories about the adventures of Noah and Aidan – AKA Plumpkin and Tickles.